Welcome to the 2018-2019 school year! I am both grateful and humbled to have been selected to serve as President of Archbishop Carroll High School. It is truly a blessing to have been afforded the tremendous opportunity to return to my alma mater to partner with you and your child as we begin a new school year. Archbishop Carroll High School has proudly enjoyed a rich history as a strong, faith-based institution within the Archdiocese of Washington, and I am excited about the possibilities as we work to further enhance our instructional program. I am pleased to announce the recent appointment of Ms. Élana Gilmore to the position of Interim Principal of Archbishop Carroll High School. Ms. Gilmore has served our school community in a variety of capacities during her tenure at Archbishop Carroll High School, most recently serving as Assistant Principal for Student Affairs. I am confident that Ms. Gilmore will continue to promote and support our school’s strong academic culture and will effectively lead our quest to ensure our students’ successful matriculation through high school and college. Please join me in extending congratulations and support to Ms. Gilmore in her new role! As parents, you are important members of the Archbishop Carroll school community and play an integral role in your child's education. It is parents’ enthusiasm, support and involvement that inspire children to do their best and to strive to meet goals for academic achievement. 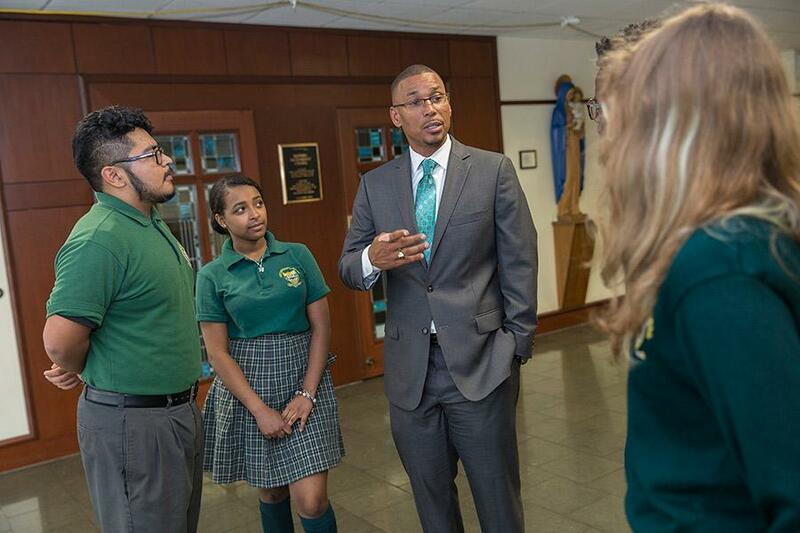 Your support, coupled with the dedication and teaching expertise of our faculty and staff, will help to ensure your child’s success here at Archbishop Carroll High School, college, and beyond. As a college preparatory program, our staff is relentless in our efforts to ensure that all students will leave our school equipped with the knowledge and skills needed to successfully complete college and to compete in the workforce. With God’s grace, a rigorous instructional program, and your support, we will achieve this goal! Thank you for your commitment to your child's education and I look forward to meeting and partnering with you.